Warmth and nostalgia arise from this twist on a classic favorite. From the humblest of stews to the most luxurious of bisques, soups have long enjoyed a highly regarded place in every culture of the world. With every spoonful, we find comfort in their warmth and their flavors, savoring the seeming simplicity of the herbs and spices harmoniously at play with ingredients that otherwise might seem to have no true rhyme or reason. Soup is, in essence, the liquid equivalent of love. Heritage is passed down in their recipes, stories shared in their ingredients. And most especially in the months when the weather has turned cold, we find an undeniable sense of contentment as we lift spoon from bowl to mouth and inhale the aroma of the wonder that awaits. So just what is it that makes certain soups more comforting on the coldest of days than others? 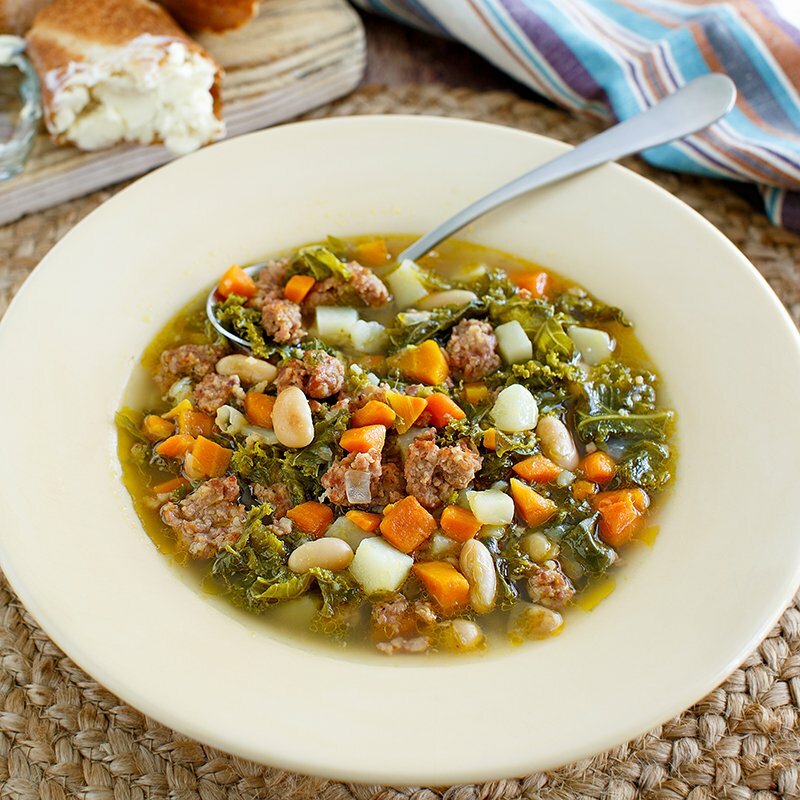 “Seasonal vegetables add a certain earthiness that really defines harvest season soups, and the warm spices like cinnamon and sage really complement that rich, comforting depth that makes a soup seem heartier,” said Patrick Moore, owner of All American Heroes, Inc., in Navarre. A self-taught chef who follows the whims of his mood and the seasons to determine the daily rotation of soups at his wildly popular sub shop, Moore certainly appreciates the ways that the perfect bowl can comfort the soul. All the much more so when those soups are made from scratch. But even if you’re not what one might call a practiced cook, scratch-made soups can really be quite simple — especially if you use an Instant Pot® or Crock-pot® to take the worry out of it, as many seasoned home chefs do. “Even the most amateur cook can create fantastic soups, and that’s really one of the wonderful things about them,” said Ron Kilpatrick, who with wife Heather owns and operates Lucy’s in the Square, a dog-friendly eatery. “Anything goes, and the option to throw in ‘everything but the kitchen sink’ helps use up items that otherwise might go to waste. Partially used veggies and even veggies that seem on the verge of being past their use are perfect for soups — especially when you boil them down to create a vegetable broth. That’s certainly something useful to know, especially when trying to stretch a dollar or empty out the fridge. Soup knows no boundaries and follows no rules, demands no highly pedigreed ingredients to achieve flavors that soothe us and embrace us with their warmth. “During the cold winter months, people naturally gravitate toward eating dishes that bring them an internal sense of warmth, and soups not only provide that, they also have a nostalgic quality to them that people find comfort in,” Chef James Neale, executive chef at Havana Beach Bar and Grill in Rosemary Beach, said. “Soups are amazingly complex in the flavors that they can achieve, but they’re also something that most people can easily create on their own,” he goes on. A chef with more than 15 years of professional experience, Chef Neale’s own appreciation for the beauty of a well-executed soup is heightened with the changing of the seasons, when he can explore a greater variety of ingredients that lend themselves to the heartiness of harvest soups. 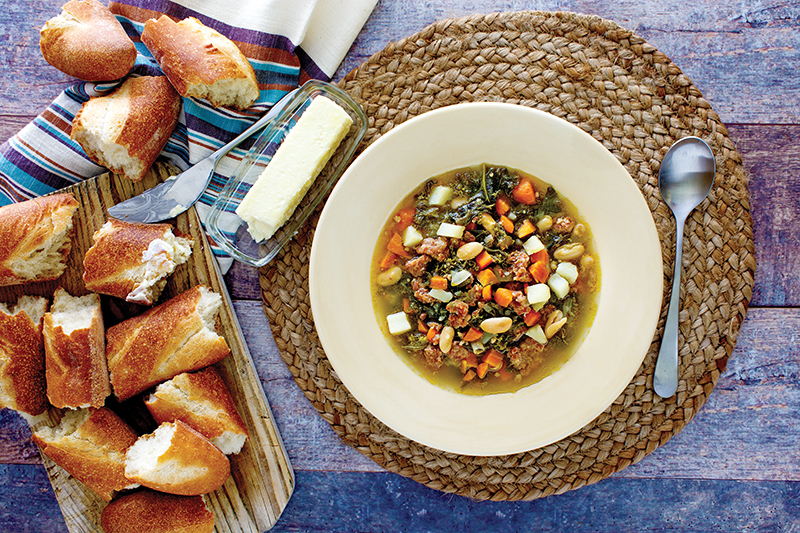 From pot to bowl, soups are love ladled out, scented with heart and seasoned with tradition. In a large skillet over high heat, sauté the onion, carrots, garlic and olive oil, cooking until carrots have softened and onions are translucent. Add the sausage and cook until meat has browned. In a large soup pot, combine beans, potato, kale, bay leaves and chicken stock. Bring to a gentle boil and stir, then add meat and all sautéed ingredients, seasoning with salt and pepper to taste. Reduce heat to a simmer for approximately one hour. Remove bay leaves. Ladle soup into bowls and serve topped with croutons and shaved Pecorino Romano cheese. Recipe provided by All American Heroes, Inc.